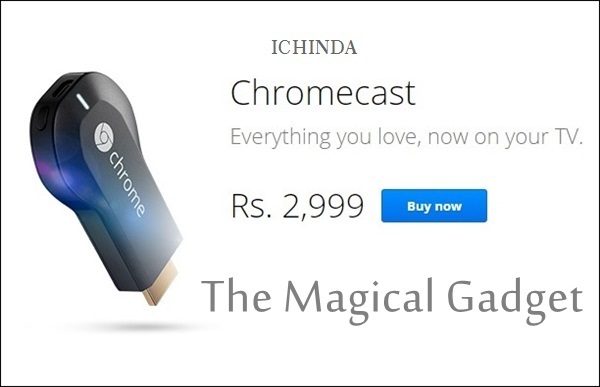 Search Engine Giant, Google has launched a magical gadget to please the gamers and music lovers, the all new Chromecast which allows you Cast your favourite entertainment from your phone or tablet straight to the TV which is available in India priced at Rs 2,999 along with free broadband and 60 GB data from Airtel and 2 months free subscription from Eros. The all new Google Chromecast is a revolution in the world of entertainment wonderfully designed to meet your need in next generation. Charmocast is a thumb-sized media streaming device that plugs into the HDMI port on your TV. Simply use an Android phone, tablet, iPhone®, iPad®, Mac® or Windows® laptop, or Chromebook to cast your favourite entertainment and apps right onto the big screen. It works with a growing number of apps. Find your favourite apps and discover more at chromecast.com/apps. Chromecast works like a projector allows you to mirror the small screen to the big screen. If you’re on your laptop, you can cast any website in Chrome; and from your Android phone or tablet, you can mirror your screen to the TV. Chromecast makes your phone into a personalised remote control. You can use it to search and browse, play, pause, rewind, control the volume and even make playlists. While casting, you’re free to use your phone for other things. Your friends and family can cast to the TV using their own phone or tablet too – with no additional setup required. Everyone can sit back and enjoy together on the biggest screen in the home. When you’re not casting, the TV screen becomes a beautiful backdrop filled with images you can customise. Learn how to set up this feature at chromecast.com/backdrop. Everyone can enjoy Chromecast. It works with the devices you already own including smartphones, tablets and laptops. Plus, it automatically updates with new features and we’re adding more apps all the time, so your Charmocast keeps getting better. It takes only a few minutes to set up, and at Rs. 2,999, it’s affordable to get one for every HDTV in the house. You can enjoy….Just Plug Chromecast into any HDTV, Connect it with your Wi-Fi and Cast apps from your mobile device to the TV. So simple to use. At last few honest word, the all new Google Chromecast wonderfully deigned to revolutionize your multi-tasking. What you think? Please first to write a review.